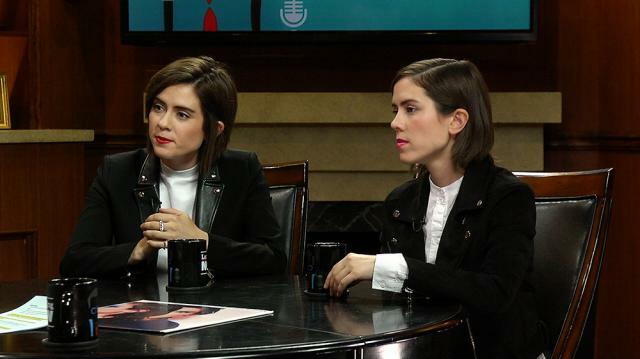 Musical duo Tegan and Sara maintain that Canada – from where the pair hail – is more progressive than America when it comes to gay and trans rights, in part because of the country’s political system. Larry King: Concerning gays, transgenders, is Canada progressively ahead of America? Sara Quin: Yeah, Canada's politics are a little more progressive. Larry King: Why? Well, you have a very progressive president. Tegan Quin: We do. But you know, the truth is is that marriage equality happened as our progressive government went out of government and a conservative government led for over ten years. But I think Canadians are inherently open-minded. I think that there is something built into the fabric of our country that is, I mean, we jokingly say it's socialism. But, I mean, I think we do believe in taking care of each other. It's a much smaller country than America, so I think we feel a responsibility to everyone. We have a multi-party system. I mean, you know all this. So it's, it's also, I think we want to represent the people. And, you know, we had a very amazing Prime Minister who passed marriage equality and said the, the rights of the minority should never be subject to the whims of the majority. And I think that we live by that in Canada. And so now, overten years later, with the transgender movement happening and people standing up for transgender people, you know, we're legislating change ahead of America. But, you know, I think America's a great country. And I think that there's a lot more people here, and there's a diverse group of people in America. And I'm, we both date Americans. We've both worked in America for 17 years and I'm hesitant to say Canada is better. But I think that we're, it's easier for us to wrap our minds around taking care of each other. Larry King: Canadians are more interested in American politics than Americans are interested in Canadian politics. Larry King: His father wasn't bad either. Tegan Quin: He was incredible. Sara Quin: Pierre Trudeau was also amazing. Larry King: Very popular, right? Got an 80% popularity rate. Tegan Quin: Making change. People like that. They want to elect a leader and then they want to see change happen. Sara Quin: And I think we, as Canadians, we are interested in what's happening in the United States because it's hard to turn away from it. And it influences and informs and impacts so many people. Yeah, it's big. And we're definitely tuned in and watching that every day.